I’ve spent much of this year organizing and researching some photos I obtained early in my “photo rescuing” efforts. Unfortunately, with these, I have no idea where I bought them, and I’ve yet to make a successful “reunion” for many of them. But, armed with the desire to find a more permanent home for these, I’ve decided to start this blog series. If nothing else, I can document my attempts and put this information on the web, where someone might stumble upon it. 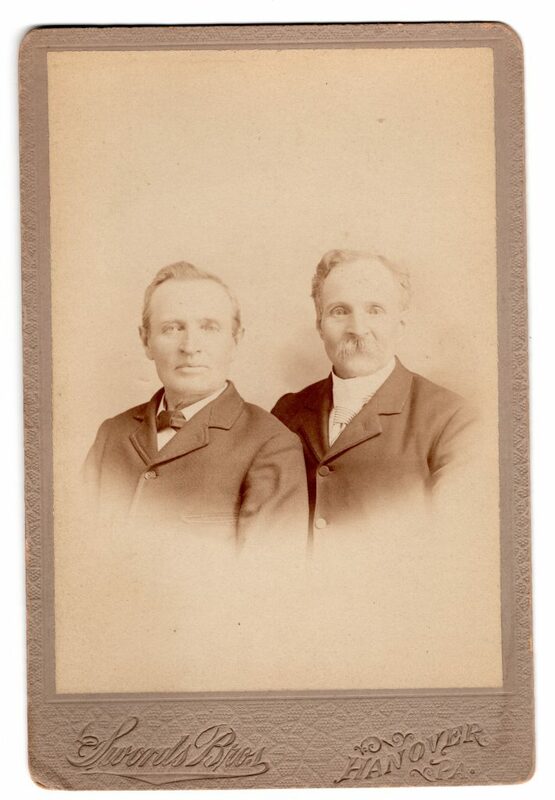 Today’s entry is one such photo, a cabinet card, probably from the 1880s or 1890s, featuring two brothers. I took the few clues and headed over to Ancestry.com. For this type of photo reunion project, it’s usually my first stop – given the wide array of available resources – and also the proliferation of Member Trees, where I might locate a descendant with relative ease. Having searched for a Hanson Hersh who lived in Hanover, PA, the first promising lead was a FindAGrave page, and, as luck would have it, it linked to a sibling, Alfred John. Given the relative timeline and location, I was certain I had found our gentlemen – but of course wanted to consult some primary sources as well. 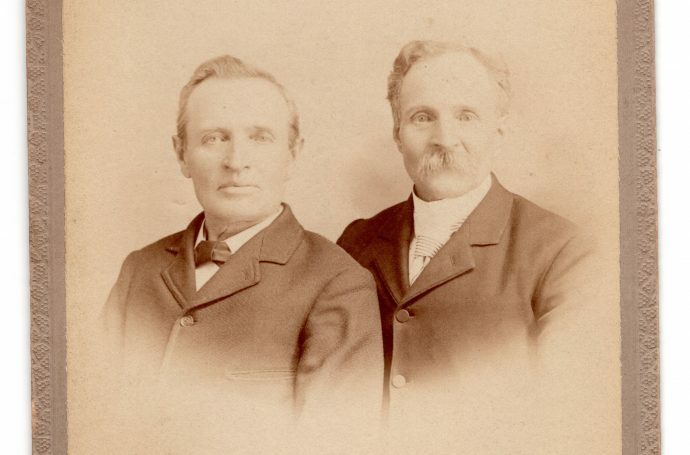 I found the brothers together in the 1850 U.S. Census1 and other supporting documents made it clear that these were the same brothers in question, and I could further posture that this picture might have been taken while A.J. was visiting Hanson, as Hanson lived most of his life in close proximity to Hanover, where the shot was taken. Though it’s always a joy to find an identified photo, we’re often greeted with dilemmas. In this case, there’s no easy to way to distinguish the two brothers from one another. Although I’m exceedingly grateful for the relationship identifier, they were born just two years apart – it would be speculative guesswork to assign an identity to one or the other. While, to my eye, the man on the right looks older than the man on the left, I think a case could be made in either direction. If I were to conduct in-depth research, here, I’d look for any sort of physical description in extant records. These men would have been too old for the 1917 World War I draft (and Hanson died in 19152 but who’s to say that facial hair or lack thereof would remain constant through the decades. That would, however, be a place to start. Beyond that, I’d attempt to find extant photographs of either man – to see if an exact identification is possible. 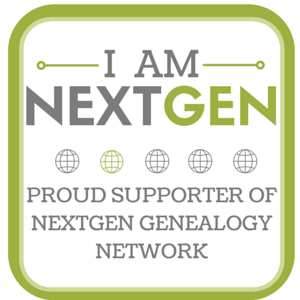 For now, I’ve reached out to the person who maintains many of the family graves and inter-linked relationships on FindAGrave, to see how she is connected. When time allows, I’ll begin doing some descendancy research: both men had children, but I haven’t had time to go much beyond that first generation. For the time being however, I’ve scanned the photo on both sides and uploaded it here – if you know anything about this family, or if you’re researching these gentlemen, don’t hesitate to reach out!